Most people fear change. Whether clouded by nostalgia or the comfort of daily routines, any step in a new direction is bound to challenge those who aren't ready for it...and while the reboot of a beloved movie and TV franchise hopefully won't affect you as much as a career switch or cross-country move, some people get awfully defensive about their escapist entertainment. Yet plenty of die-hard disciples welcomed J.J. Abrams' Star Trek (2009) and its successor Into Darkness (2013) with open arms, losing themselves in the ambitious action sequences, new cast members, sweeping soundtrack, and slick special effects. There were holdouts, of course, and on some level I still count myself among them. The first film was entertaining (especially in a theater full of Trekkies), but it didn't have enough staying power to make me count down the days until Into Darkness with bated breath. So, I ended up doing what most people do when they're not quite excited enough for a trip to the theater and aren't the torrenting type: I just waited for the Blu-ray. In hindsight, both Star Trek and Into Darkness are competent, entertaining examples of sci-fi escapism and, however recycled or different than what came before, include their share of strengths and flaws like most every other Trek film. Either way, it's obvious that change was on the horizon after franchise fatigue set in sometime between Voyager and Enterprise. Still, the last time we saw Trek's original cast on the big screen was The Undiscovered Country (1991) and, to a lesser extent, Generations (1994), both released during the franchise's most popular decade. Maybe this 15-year gap warranted hitting the reset button, or maybe it didn't. But Abrams and company hit that button with both hands, boldly going where Roddenberry's creation had never gone before. Which is kind of the point, if we're being honest. So, are these new movies boldly going in the right direction? I certainly can't argue with the decision to use established characters and, by extension, rewinding their history to tempt younger audiences. Sidestepping that same history to create more of an alternate universe also dodges a few bullets and allows both films to literally pick and choose Trek's best elements like a smorgasbord. So, what we've essentially got here is "The Next Generation" of the original series and, for the most part, its sleight of hand is cagey enough to keep all but the staunchest canon worshipers from setting their phasers to "kill". In fact, I'd imagine that most surface-level complaints stem from Abrams' brand of filmmaking; specifically, lens flares, extensive CGI processing and occasional lapses into "teal and orange" territory. But with Abrams locked in as director of Star Wars Episode VII, the forthcoming new Trek installment may rest on other shoulders. The positives outweigh the negatives by an obvious margin, but there's plenty of both in close quarters. Kirk and Spock's yin-yang personalities are arguably more effective than ever here---especially during Into Darkness---while Spock's relationship with Uhura just seems more like an afterthought. Khan is played with plenty of menace by Benedict Cumberbund, but the liberal swiping from perhaps the franchise's finest hour is off-putting. And let's be honest: the performances are mostly solid and much of the casting is inspired, though our faithful crew often just impersonates those who came before...or is it after? 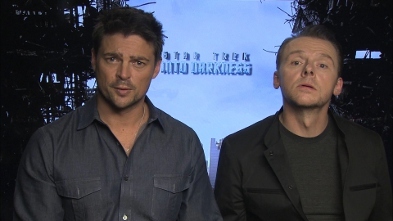 Chris Pine (Kirk), Zachary Quinto (Spock), and Simon Pegg (Scotty) manage to pull off the balance, but others like Karl Urban (Dr. McCoy) and Anton Yelchin (Chekov) don't reach the same heights. So while they're not completely "turn of your brain" popcorn flicks, both Star Trek and Into Darkness aren't quite as substantial or satisfying as some of the franchise's finest big-screen outings. But they are sporadically entertaining, dramatic, funny, suspenseful, and full of nice little moments for even the most seasoned Trek fans. Most importantly, though, they've injected plenty of life back in to a franchise that, before 2009, was effectively in hibernation for the first time in almost 20 years. With any luck, Star Trek won't be going away again for a long, long time. Both Star Trek and Into Darkness were already released on Blu-ray in 2009 and 2013, but only the former was anything close to a definitive effort. Into Darkness arrived with only a few extras and the rest were held back as retailer exclusives (including more than a dozen featurettes and even an enhanced commentary track) in a move that royally pissed off Trek followers who have long since been exploited by double dips and inflated sticker prices. Enter The Compendium, a new four-disc tome that collects the excellent Special Edition of Star Trek and a proper release of Into Darkness, including most of those elusive extras and even a shifting aspect ratio that replicates the film's theatrical IMAX exhibition (minus the 3-D). This extra headroom, framed at 1.78:1 instead of 2.39:1, affects roughly 30 minutes of the film and adds to its effectiveness, much like similar Blu-ray releases of films like The Dark Knight. It'll be frustrating for those who shelled out for any of this stuff the first time around...but for everyone else, it's a no-brainer. Not surprisingly, the 1080p transfers for both Star Trek (2:39:1) and Into Darkness (2.39:1 and 1.78:1) are about as perfect as it gets for current Blu-ray releases. Please note that, aside from the second film's new shifting aspect ratio during the IMAX scenes, these appear to be identical to the previous releases...so, assuming you were impressed the first time around, you won't find any reasons to be disappointed in the least. The films' highly stylized appearances hold up nicely: whether or not you're a lover of CGI, lens flares, and/or "teal and orange", both films appear faithful to the source material in every conceivable manner. Colors are bold and bright, textures are strong, image depth is superb, and black levels are deep and inky from start to finish. In fact, there's very little to say here that you haven't read in countless reviews of top-tier Blu-rays before, so let's just call these discs "reference quality" and leave it at that. 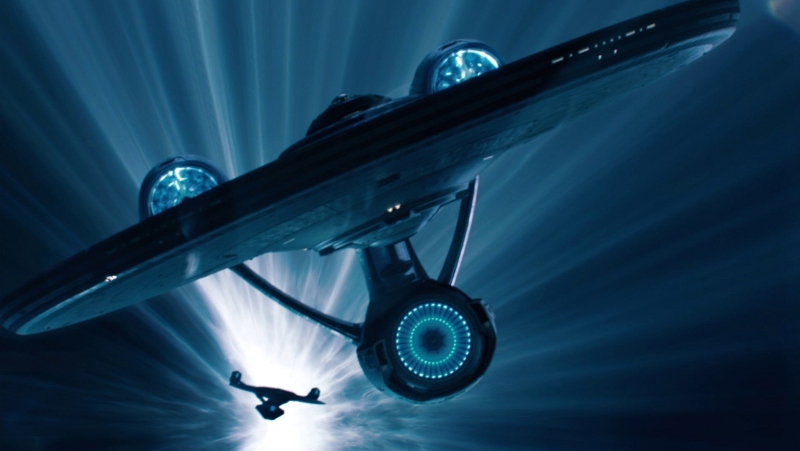 Not to be outdone, the default Dolby TrueHD tracks for Star Trek (5.1) and Into Darkness (7.1) are extremely active and command all kinds of attention. LFE and surround channel activity are generous, especially during the many action sequences and Michael Giacchino's use of music. Dialogue and sound effects are crisply rendered, from the pulse of phaser blasts to the familiar fwhoosh of doorways. Though I'll admit that the near-continuous sonic assault of both films can almost hamper its overall effectiveness at times, there's no doubt that the source material has been transferred faithfully and, thanks to the benefits of lossless audio, those who enjoy their movies loud will really get their money's worth here. Optional English subtitles, SDH captions, and a handful of foreign dubs and subs are included for both films. 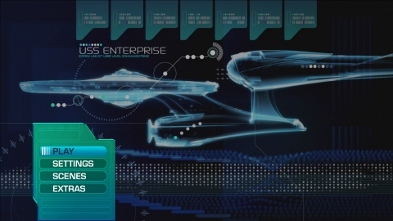 Aside from the new content on Into Darkness, the menu interfaces for both films remain exactly the same as their earlier counterparts. Navigation is smooth and simple, although a handful of trailers, warning screens, and other advertisements must be dealt with beforehand (mostly on the first movie). This four-disc release is housed in an embossed, matte-finish "book" case with four overlapping hubs and no outer slipcover; separate Digital Copy redemption codes are included for both movies, and the content listing for all four discs is printed on a removable back cover sheet. So while the packaging itself isn't especially detailed, it's very easy to access and doesn't hog too much shelf space. Since both discs for Abrams' Star Trek are identical to those found in the 2009 Special Edition, I'll refer you to our review of that title for a full breakdown of the mountain of supplements included therein. Plenty to dig through there. As for Into Darkness? Well, things get a little more complicated, but the short version is "pretty much everything held back from the various exclusive versions scattered across the land roughly a year ago." Yes, the sting of such a short-sighted and dense release strategy can still be felt, and the pain has increased just a little bit more now that fans have to re-buy both films to get something close to a complete Into Darkness package. But again, plenty to dig through. For starters, everything from the 2013 Blu-ray is ported over (aside from the DVD, not surprisingly), which includes eight brief Featurettes about the film's production. Topics include location designs and development, filming two of the action scenes, reusing a famous Trek villain, and more. They're worth watching but rightly regarded as "appetizers". And speaking of appetizers, many of the like-minded retailer exclusive Featurettes---from the likes of Target, Best Buy, etc.---have been herded together here, as well as two new ones. There are plenty to choose from, including "The Voyage Begins Again" (2:28), "Introducing the Villain" (2:16), "Rebuilding the Enterprise" (5:31), "Home of the Core" (4:32), "Aliens Encountered" (6:54), "Vengeance is Coming" (4:28), "Mr. Spock and Mr. Spock" (4:08), "Down with the Ship" (6:09), "Kirk and Spock" (5:36), "Brawl by the Bay" (5:44), "Fitting the Future" (5:03), "Property of Starfleet" (4:53), "Unlocking the Cut" (5:10), "Visual Affection" (9:03), "The Sound of Music and FX" (5:26), and "Safety First" (2:27). These are all pretty self-explanatory, but general topics include special effects, make-up, comparisons and contrasts to Roddenberry's vision, character relationships, costume design, props, editing techniques, and even a fun little on-set prank. On a related note, we also get a new Gag Reel (5:48) that eventually morphs into a dance-off. The real centerpiece of these bonus features---and again, one that was originally exclusive to iTunes, of all places---is a whopping Enhanced Commentary Track (162:47) that makes great use of PiP mode, time lapse, and even football-style illustrations on the image itself to analyze, dissect and, well, enhance the overall experience. This is divided into nine sections that collectively cover the visual effects, music, editing, story, cinematography and more. Many are scene specific and very in-depth, featuring key crew members including J.J. Abrams, Michael Giacchino, VFX supervisor Roger Guyett, Damon Lindelof, and others. It's a really well-done supplement and, though a few bits and pieces are repeated during the 2+ hours of separate featurettes, there's a wealth of collective information here and it's all worth digesting. Also here are a few Deleted Scenes (7 clips, 5:25 total) including "Nibiru Captain's Log", "Marcus' Office (Alternate Version)", "Room Attack (Alternate Version)", "Carol's Accent", "Klingon Conversation (Alternate Version)", "Scotty Cargo Bay Door", and "Kirk Meets Girl". These are technically new to Blu-ray but some have been available online before. Last, but certainly not least, is a short Promotional Gallery of trailers and TV spots for Into Darkness. No posters, unfortunately. Optional subtitles have been included in English, SDH, French, Spanish, and (for Into Darkness only) Portuguese. The only glaring omissions---aside from the lack of 3D----are two deleted scenes, a collection of interview segments, and other little nuggets of content that were apparently released last year as XBOX Video exclusives. The Compendium is an aptly named collection of two polarizing Star Trek films: whether you love or hate Abrams and company's take on the franchise, this four-disc set remains the best way to take everything in. As expected, the two-disc presentation of 2009's Star Trek remains identical to Paramount's excellent Special Edition, while Into Darkness gets the treatment it deserved in the first place: a fully loaded assortment of bonus features, plus a shifting aspect ratio that better replicates the IMAX-sourced footage. All told, there's hours of content to dig through here and most of it's well worth watching, so your decision to purchase The Compendium rests solely on your level of Trek fandom. Those who already bought the Special Edition and Into Darkness on Blu-ray (specifically, any of the retailer exclusives) may want to proceed with caution, but everyone else should consider this worth a purchase. Firmly Recommended.